Deer-stocking.. across the universe.. (part one)..
We arrived on site at Deerstock on Thursday afternoon for some early revelry – once we’d set up and settled amongst the other festival pioneers it was really just a splendid afternoon and evening for nattering, eating and drinking. The most exciting part of the day came though when Pete and Becky asked us to keep an eye on their lads for a while, they disappeared off to Nana’s Kitchen for dinner and came back engaged! Pete had been plotting with Ella, and we’d agreed to watch the boys whilst he whisked the Evil Mead Lady off to a pre-planned steak dinner and proposed. As they returned to the gathered folk we sat and stared for a while, before Becky announced it was okay to hug her now – awesome news! They make such an ace couple. The other thing of note was that upon visiting the on-site portaloos, the inclusion of some air-fresheners made them the most fragrant ever! The festival proper of course started on Friday though – over a breakfast cider we were treated to a jam from The Star Copiers (well, most of them, Kieron was absent and there’s an extra one now) at the campsite, Paul and Sarah had brought vodka infused watermelon as has become a bit of a Deerstock tradition whilst breakfast was a delicious bacon sandwich courtesy of Nana’s Kitchen (and of course washed down with aforementioned breakfast cider). 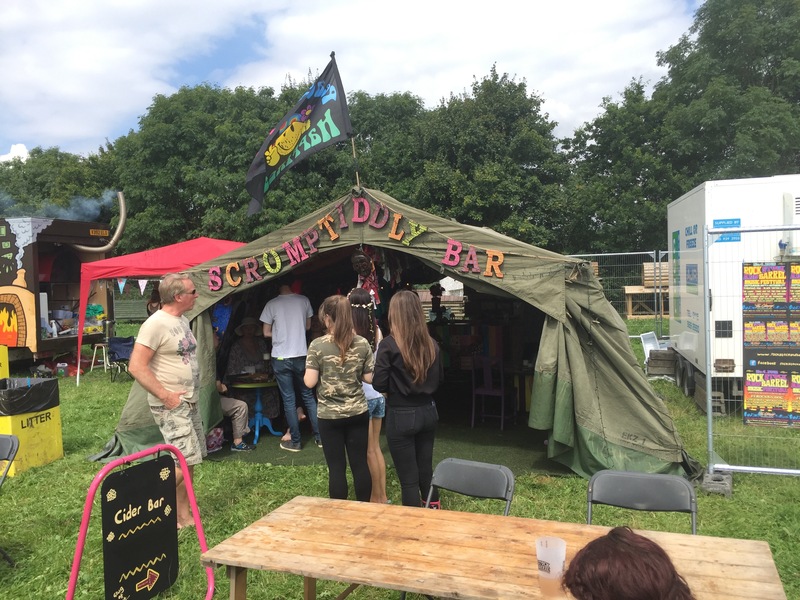 We headed up to the arena to be assailed by the wonder of the fruit ciders available from the Scrumptiddly Cider Bar (as well as more regular ciders) – the firm favourites over the weekend being Pineapple, Rhubarb and Mango (and the trusty Lily the Pink as well). The weather was absolutely stunning – being typically British we complained it was too hot. There was time for a brunch mead from The MeadEvil Bar too! 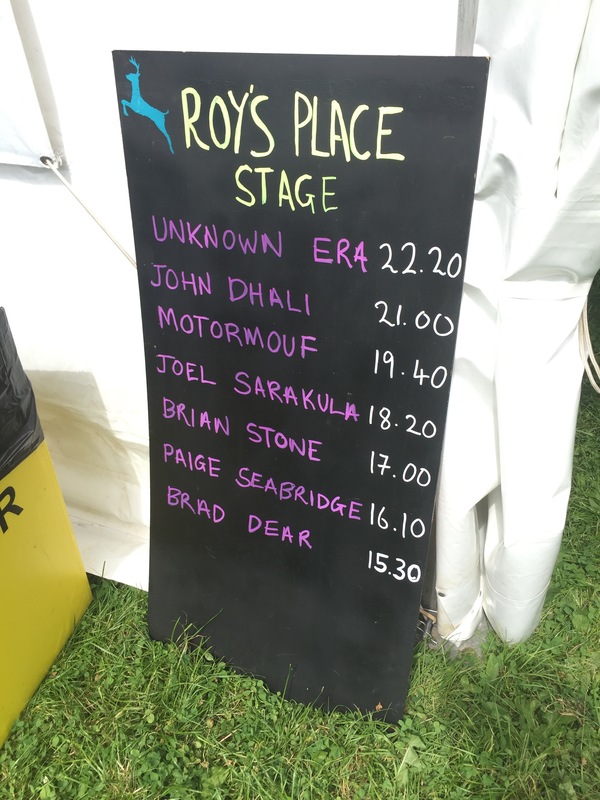 Brad Dear kicked the music off – the second stage this time inside a big marquee also housing the merch and the regular bar, and dedicated to Roy Stone, a much better arrangement than the trailer stage last year. He was without Andy and Chris for a solo acoustic spot, kicking off with Leave It All Behind and into The Only Road That I Know. Clearly feeling a little playful he went for an unusual cover of Wagon Wheel. He finished up the set with his own songs Far Away, Made Up Love Song (or most of it – Kev asked for it), Special Brew and an encore of I’m Still Here, he had a chance for a natter with folk but alas wasn’t making a weekend of it, with an appearance at Nottingham’s Splendour festival the next day. Pity for us, but of course lucky for them! Splendour must’ve moved itself as I’m sure it didn’t used to clash with Deerstock! Paige Seabridge was up next – she enchanted us with Trouble Town, God and Satan, Please Please Please Let Me Get What I want, Fifteen Years, Heartbeats and You’ve Got The Love – it wasn’t the last we’d hear from Paige this weekend though, I hadn’t put two and two together despite her less than usual fervour to frequent the mead bar all weekend! We were camped next door to the Seabridges which was always going to make for a fun weekend! 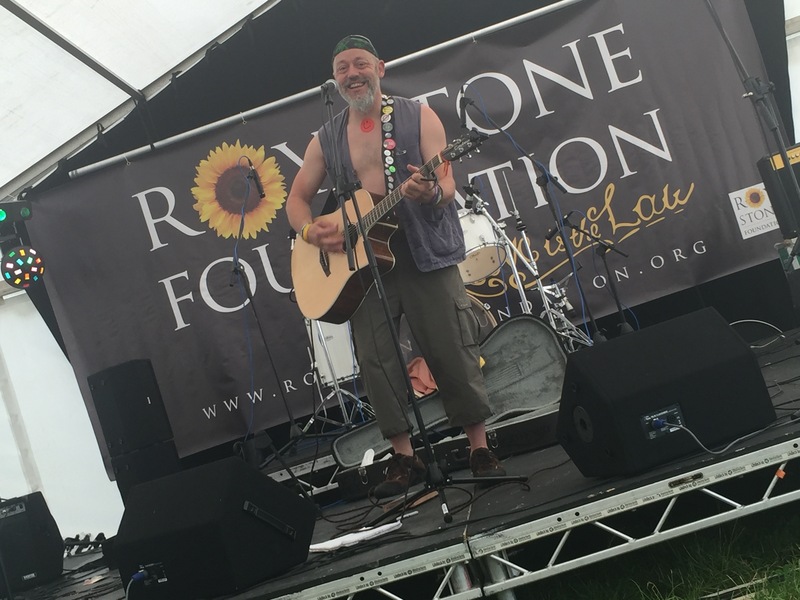 A relentless run of a very familiar trio of artists was finished by Brian Stone, he started up with a cover of Levellers’ Boatman before treating us to newish Why Do You Care? It is sad that people are so judgemental based on fairly superficial observations of people, I guess we all do it to an extent – but it’s certainly a song that resonates with me. Ward The Pirate gave us a chance to have an early dance. 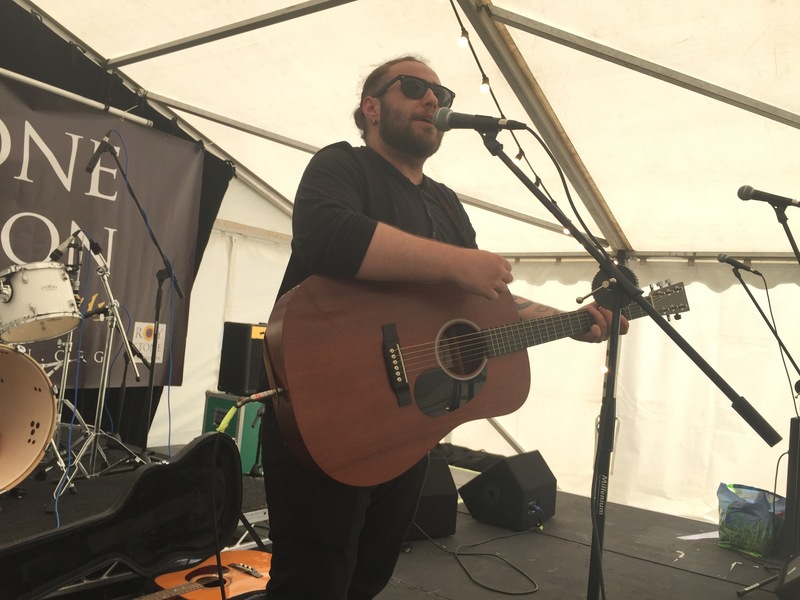 He finished off the set with his own increasingly anthemic songs – the autobiographical Life Begins @ 50 moved into consecutive tributes to both of his parents, Quiet Anarchist a fond reminisce about his Dad’s subtly rebellious ways whilst Did She Know? is a heartfelt tribute to the life and loss of his mother – it’s emotion was infectious in the crowd, but credit to Brian he kept it together. He finished it up with the wholly fun Why Is All The Rum Gone? Then we moved into the unfamiliar – The Belle Airs opened up the main stage with an interesting array of cover versions, I didn’t catch all of them as we’d started migrating towards the cider – but certainly found our feet tapping to Torn, Save Tonight, Whole Again, Valerie, Son of a Preacher Man and Mr Brightside as more people started to make their way into the arena – obviously a lot of folk were arriving on Friday as not everyone rinses their holiday on festival maximisation! 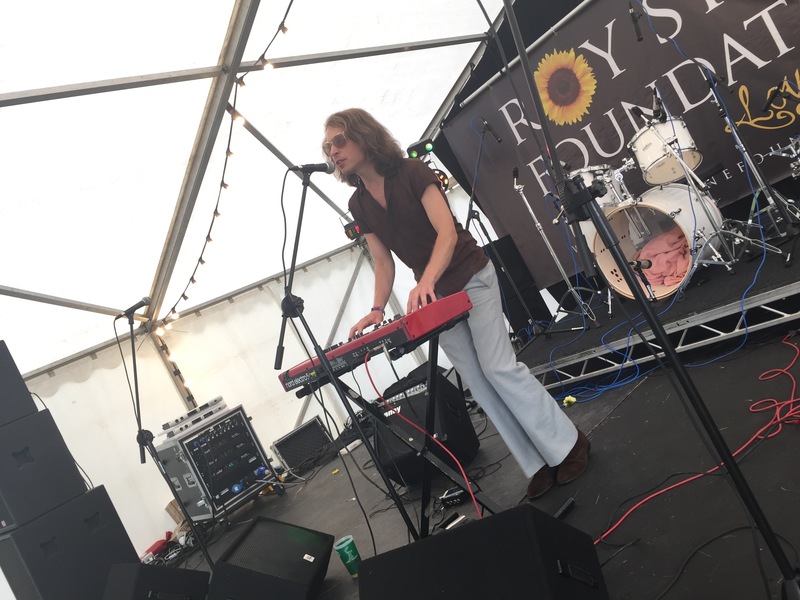 Back on the second stage Joel Sarakula was armed with a keyboard and some drum loops to unleash soulful psychedelic pop upon the crowd – I picked up a few song titles like It’s A Young Man’s Game, Northern Soul and Only One Still Dancing. It was a really engaging sound though and something a bit different! On the main stage Sea Monster Eyes treated the field to funky rock as we headed back toward the campsite, the heat (and maybe the cider) proving a little too much! 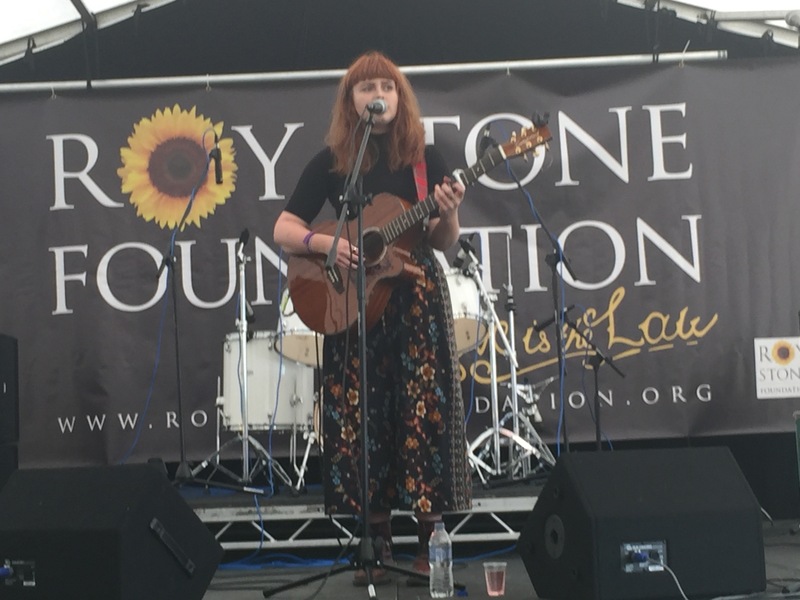 … Luna and The Moonhounds on the main stage – I must admit, much of the set was spent in the home-from-home confines of the cider bar, although we did hear an awesome rendition of Whole Lotta Love drifting through the revelry. 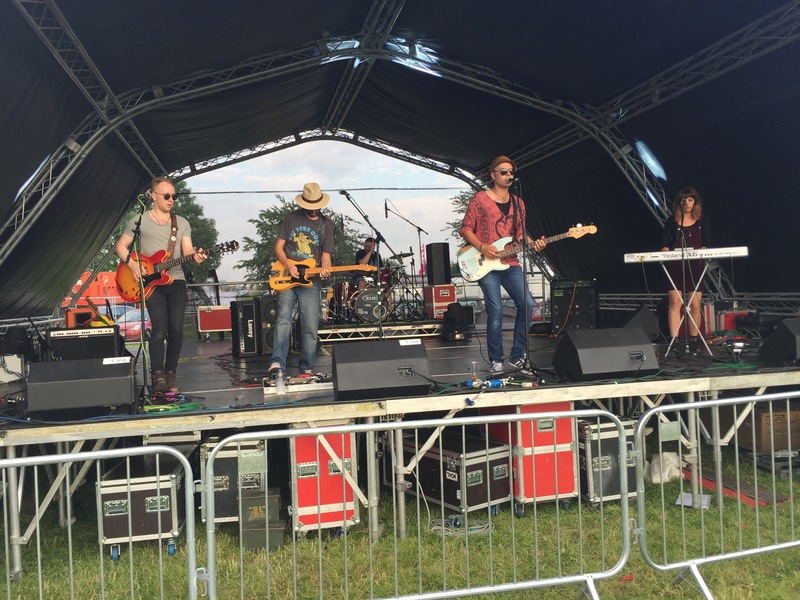 Soon after Unknown Era were filling The Roy’s Place Stage with their infectious bouncy ska goodness – we’d emerged from the tent to find a good spot at the main stage in time for the headline act by this point. 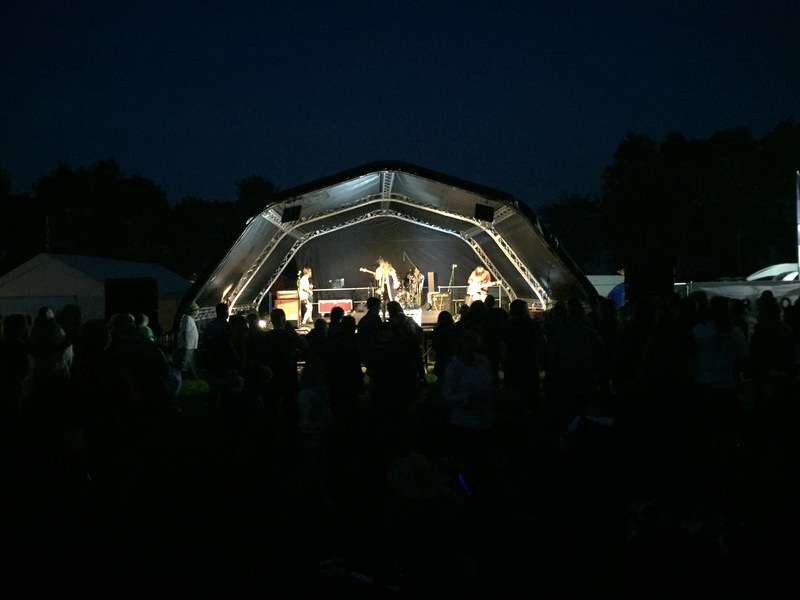 Funke and the Two Tone Baby may seem to some an unusual choice to headline a night at a festival of Deerstock’s size – but needless to say, he owned it. He makes more sound on his own with the aid of clever loops and layers than many full bands. 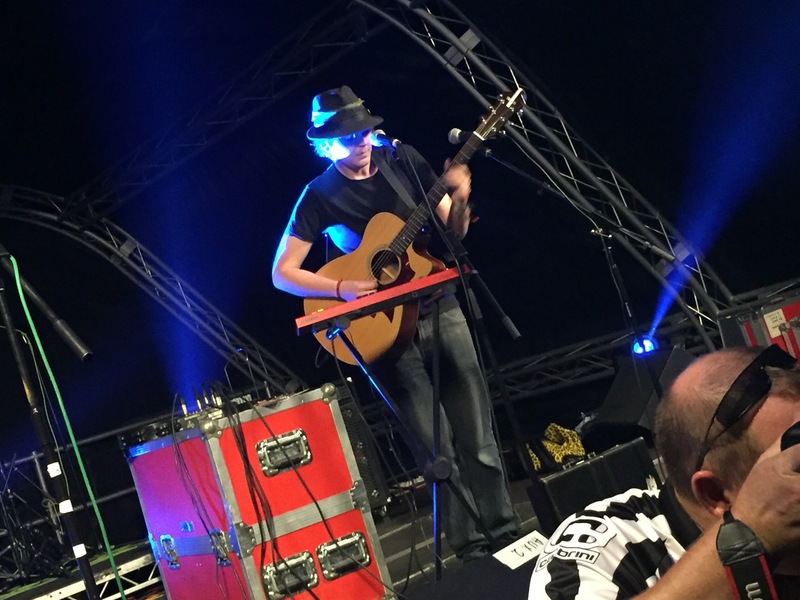 Rich handed out monkey masks to the crowd and he limbered up into his set with the customary start of Never Used To Dance – enriched with his latest round of gadgetry and gizmos! Next up was a dedication to Tina, and back to the older back catalogue with An Ode to the Pirate Ghost Witch, before probably the highlight of the set for me. He announced a dedication for the newly engaged Becky and Pete (who were watching from the Mead bar), before Paige joined him on stage for a frankly mesmerisingly lovely performance of seldom-heard-live I’ll Love You. A real treat indeed. You can watch Ella’s video of it here. Whilst Funke moved on with I’m Not Well I hotfooted it over to the Mead bar to get Paige a celebratory drink, with her abstaining for much of the day, but was back in time for a triumphant finish to the set comprising Battles, The Great Storm and of course, Not Enough Bonobo where around a dozen monkey-clad dancers joined him on stage to cavort. 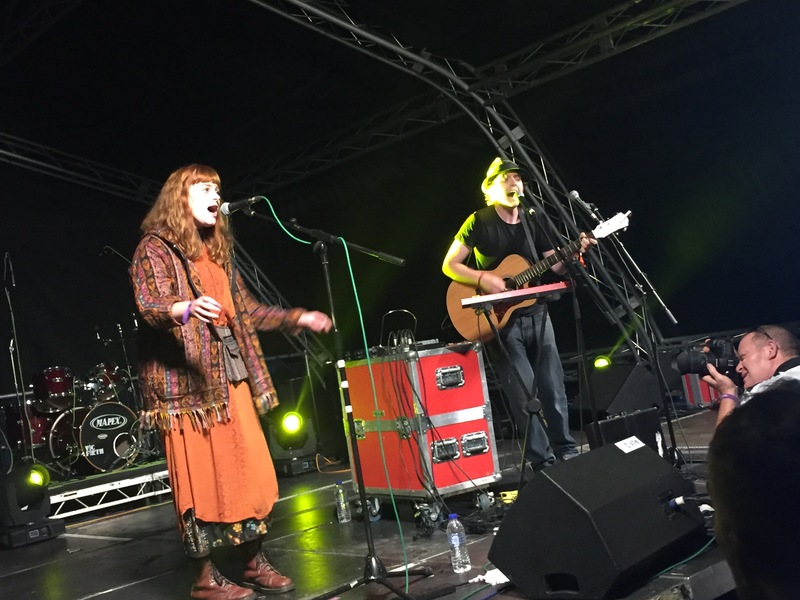 An epic set to finish off a splendid first day at the festival. 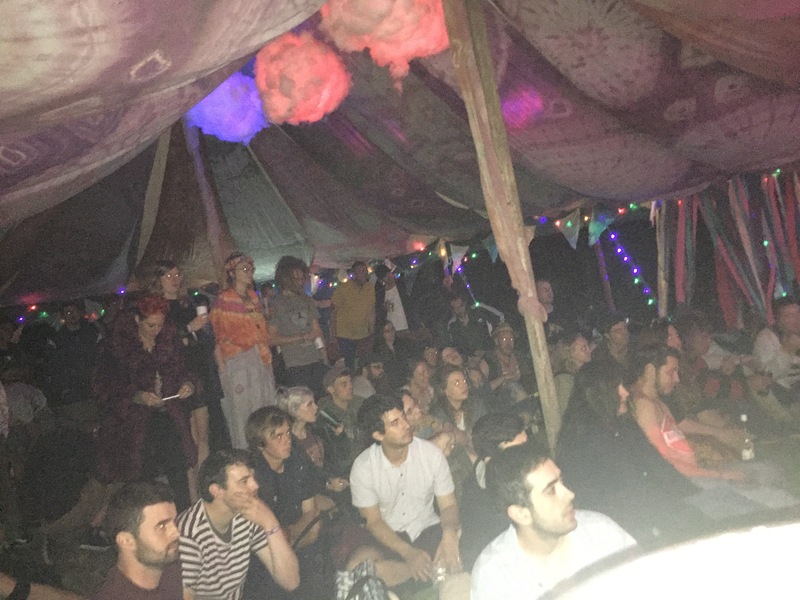 We wandered back toward camp via the Guerilla Stage in the glade, but the chilled out acoustic vibe we craved was actually pretty loud (and good sounding! ), so we wandered onward and found ourselves at Spike and Beth’s campfire for the remainder of the evening before heading to bed. 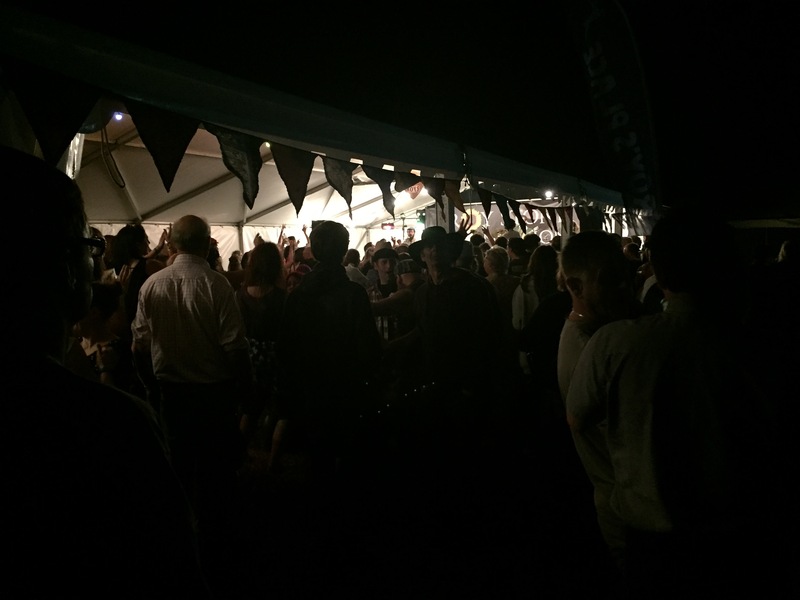 I was going to attempt to write up Deerstock in one pass – but I think I’d end up with a dissertation so I’m going to go for three parts I think… so stay tuned! 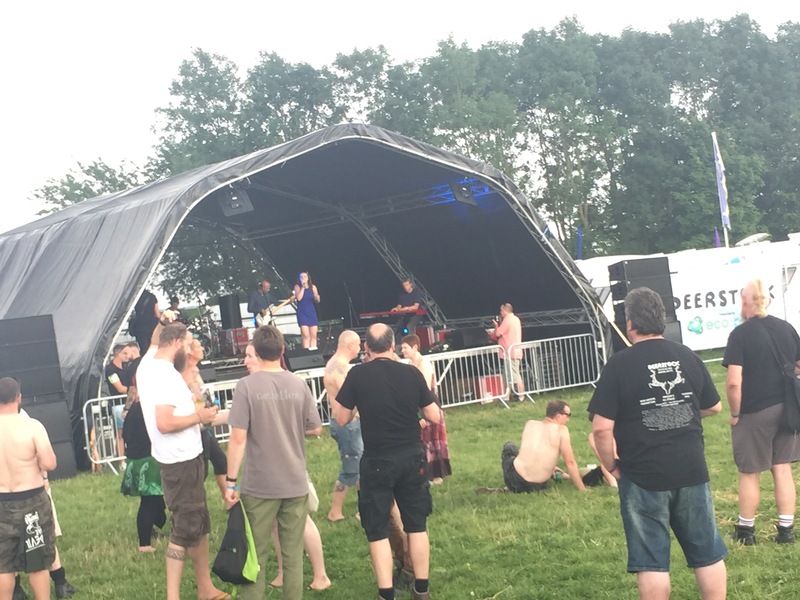 Meanwhile we’d been keeping tabs on Ferocious Dog at Chagstock – in particular the epic photos of Nadine surfing to Freeborn John with Dave as surfboard!